"I think Walt Disney would have accepted this movie if Walt Disney were alive," George Lucas once said of Star Wars. "He wasn't afraid." And now, thirty five years after Disney missed their opportunity, it was Bob Iger - not Walt Disney - who made the bid for Star Wars and the rest of the Lucasfilm empire. Lucas' connection to Disney goes back even further than the seventies. The Lucas family visited Disneyland when it opened in 1955, staying for a full week to experience the new theme park. "I loved Disneyland," recalled Lucas of his 11 year old self, "I wandered around, I'd go on the rides and the buyer cars, the steamboats, the shooting galleries, the jungle rides. I was in heaven." Some twenty years later, George Lucas was a young director not far removed from film school and already had a few winning films under his belt. The critical success of THX 1138 and the commercial success of American Graffitti created the opportunity for Lucas to pitch his space movie. Turned down first by United Artists and then again by Universal, George Lucas' space fantasy was nothing more than a treatment without a studio to produce it. Looking back on this period, Lucas recalls that "I think Disney would have accepted this movie if Walt Disney were still alive. Walt Disney not only had a vision, but he was also an extremely adventurous person. He wasn't afraid." Eventually, it was 20th Century Fox who picked up the film and changed movies forever. Even with a studio behind it, Star Wars commercial success was never a sure thing. Steven Speilberg recalls that Star Wars and Disney were always a fit: "George always described it to me as a kids' picture, a little Disney film, that he didn't think anyone would want to see, but he wanted to see it. he would get excited about it, telling me the story and showing me Ralph McQuarrie's concept painting, which were phenomenal, but in the next breath he would be putting down its commercial chances." The long history with Diseny goes beyond even George Lucas himself; it even touched the cast and crew. When deciding between Mark Hamill and another actor, Hamill was described as "Disney-esque" by Lucas when recalling the decision to cast the young actor. 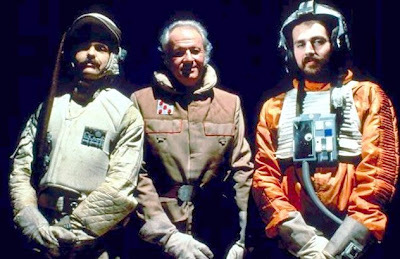 Sharing talent goes back to 1976, when matte painter Harrison Ellenshaw was hired to create the matte painting for Star Wars. At the time, Ellenshaw was heading up the matte department at Disney Stuidos, but allowed to freelance on the side. It was Harrison Ellenshaw, following in the matte painting footsteps of his father Peter, who made many of the landscapes and planets that are so iconic in the Star Wars Galaxy. Despite George Lucas' own lack of faith in the film, Star Wars became a critical and popular success. Upon reviewing the film, Variety's Art Murphy wrote that "Star Wars is a magnificent film. The results equal the genius of Walt Disney, Willis O'Brien, and other justifiably famous practitioners of what Irwin Allen calls 'movie magic'." Such a success did not go unnoticed by all of those studios who passed on Lucas' space fantasy. Not wanting to miss out on the popularity of Star Wars, Disney and other studies rushed to create imitations of the film. They created two: Space Station One and The Cat from Outer Space. The former would be renamed and released as The Black Hole. After the success of the Star Wars Saga and Indiana Jones, Lucas' connection to Disney became direct. In 1986, he became executive produce of Captain EO, a Michael Jackson experience to play at Disneyland until 1997. That same year, it was finally announced that Star Tours would open in Tomorrowland. The innovative simulator ride would be copied across the industry. Their partnership continued for the next two decades and now the Lucasfilm and Disney are one - and Star Wars will be led by a new generation future of leaders who "aren't afraid" to play in a galaxy far, far away.